When we lived in Bentonville, we went through the big ice storm some folks were out of electricity for more than a week. The following year was the big snow storm where some spots got two feet of snow. 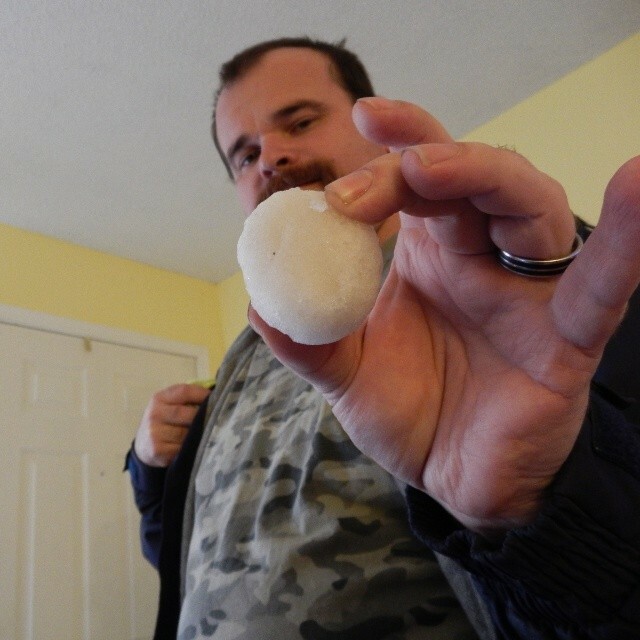 While we do get some winter storms, these two events were quite rare for Northwest Arkansas. Then, two years of basically nothing. 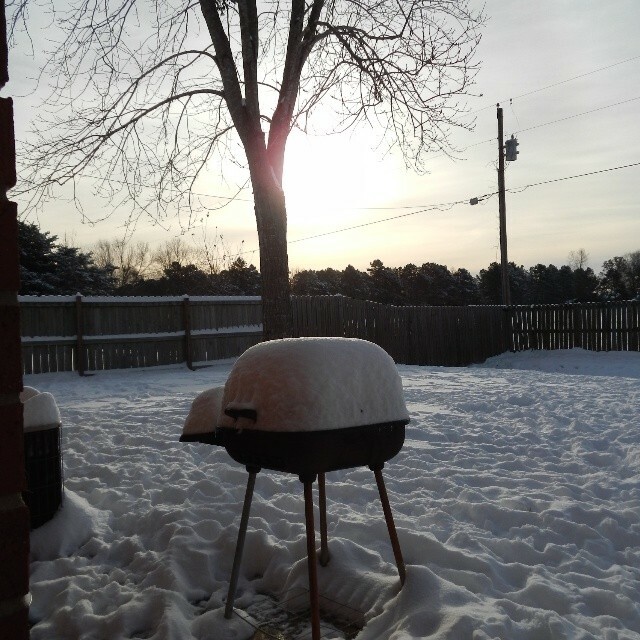 Sure, we had some small snows but nothing to really write home about (or blog about). Then this week, we had a pretty good cold front come through and while it means I’m probably home bound for at least four days, it’s so pretty to look at and it’s our dogs’ first big snow. It’s our first significant winter storm in our new home so it’s kinda fun! 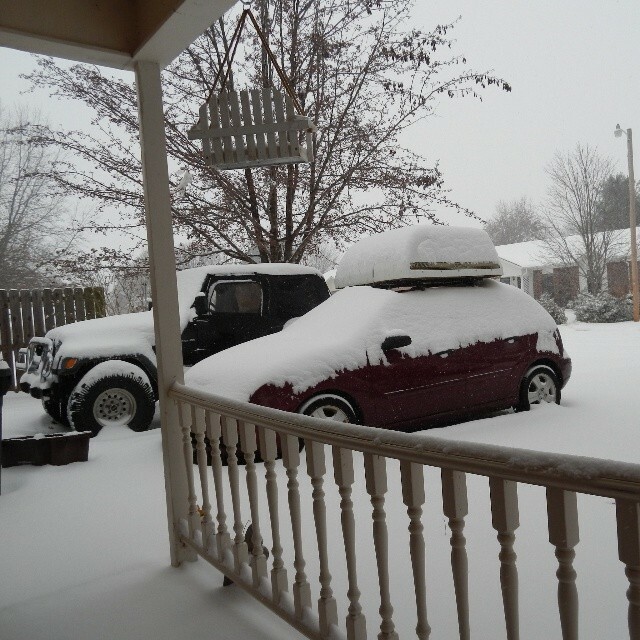 Some spots of Northwest Arkansas got up to 12 inches, we got about 6 inches or so. There was also a good amount of ice that came down before the snow. Not a big deal for the Northeast part of the United States, but for these parts it’s a big deal! It’s not supposed to get out of the 20s until middle of next week so there’s not a lot of expectation for melting. As a side note, I also got a brand new camera-the first time since 2006. I need it for my business and for my blog. So I have a lot of photos to share! 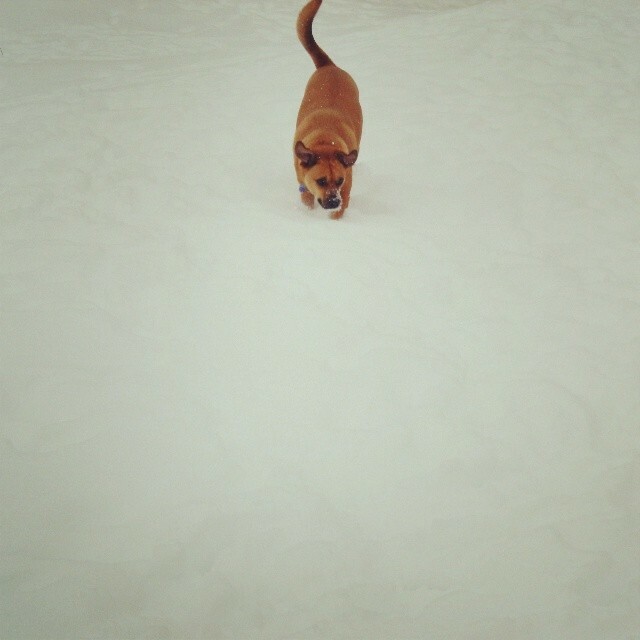 This is a great photo of Flower, who loves the snow. She loves eating the snow, hence the smudge on her nose. 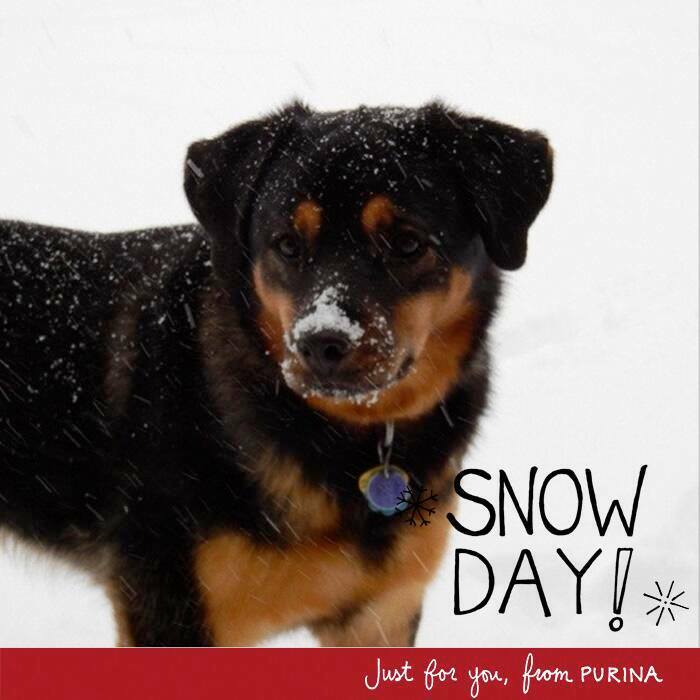 The cool thing about this photo is that I tweeted out the original and the dog food company Purina’s twitter account picked it up. They made this graphic for me and tweeted it back out. Brilliant social media strategy on their part and now I have a great picture of my dog! Jazzy made big game out of digging for her ball in the snow then tossing it on her own and digging to find it again. Only she could combine Fetch and Find into one game! This ice ball was inside one of Jazzy’s tennis balls that she had split open. We finally figured out this is why she kept licking that ball. 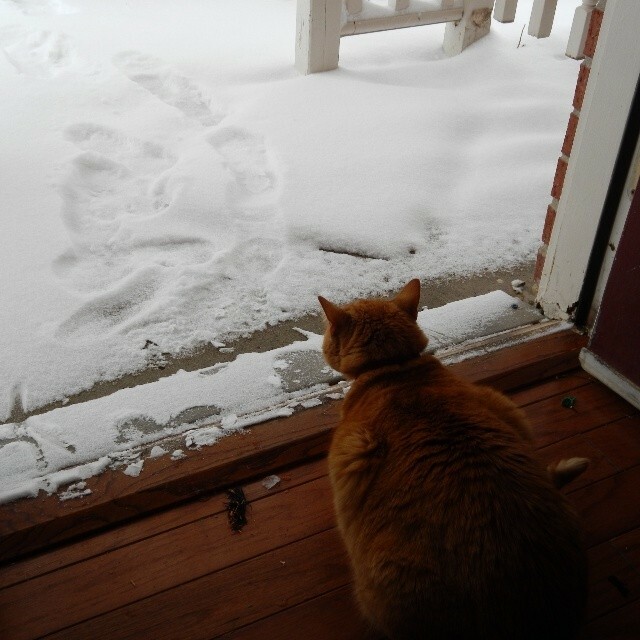 This is the only cat/snow related pictures we have. Neither one was real keen on going out in the white cold stuff. I think they remembered it from Bentonville and were annoyed that we humans brought it with us to Elkins. HA! Such a pretty scene even if it is cars. My car is always my way of telling how much snow we got. No matter what apartment or home I lived in, my car was always a good visual indicator! The morning after the storm. You can’t tell this in the photo, but it’s about 4 degrees outside when I took this. 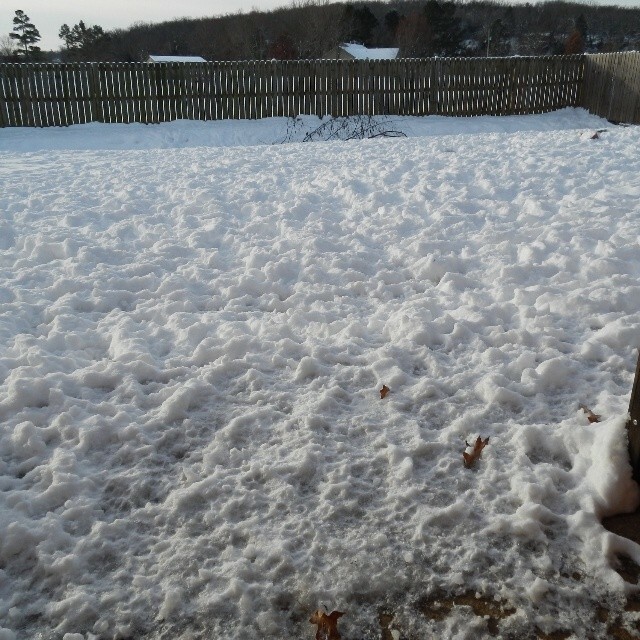 Our yard after the dogs spent much of the day playing in it. Looks well-used in the last shot. I know dogs love to play and cats love to watch, for the most part. I think I’m part cat? We ran away and went to Oklahoma instead of riding out what was supposed to be a huge ice storm in Central Arkansas! We’re finally heading home today. 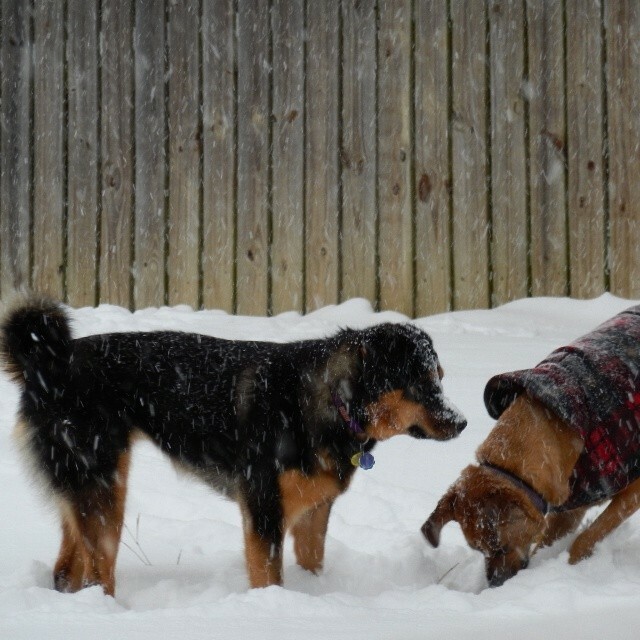 Cute photos of pups in the snow. I’m a total sucker for it!